This photo was taken of Big Santa Anita’s Creek just upstream from Roberts’ Camp. This spot is close to cabin #23, on an outside turn of the creek. As of this writing, Chantry Flats’ rain total is at 42 1/2″ for season. Good flow and good sound throughout the canyon! A view of 55′ high Sturtevant Falls as taken from the Upper Falls Trail this last Saturday. The stream crossings are so high right now that wading seems the best way to get across. Our epic winter continues, with Sturtevant Falls looking more beautiful than ever. Last weekend our rain gauge had overflowed from the accumulation of a couple more storms before we could hike back in and check it. The gauge holds 12″ of rain before it overflows, so this tells something about the rains this month. Looking downstream at Fern Lodge Junction. The stream is swollen, cold and flowing with energy. Looking across at Sturtevant Falls and plunge pool from the Upper Falls Trail. Big Santa Anita Creek comes alive after recent storms. 55′ high Sturtevant Falls is back in its’ former glory as well! As we all know, years of drought have taken their toll throughout the southwest, especially in the myriad of canyons throughout the mountains of Southern California. Joanie and I discovered 9.57″ of rain in our gauge at Fern Lodge on January 18th. Several storms, back to back, have made a huge difference in the appearance of not only the Big Santa Anita creek, but all the rest of the front country streams in the Angeles. A week later, we hiked up and past Sturtevant Falls where we took these two photos. This view taken just above Sturtevant Falls. This is at the top of the slot pools. As of today, February 10th, a lot more rain has fallen. The stream beds have been scoured of the dark organic mat that’s built up for years. This has left bright, colorful sands and rocks under the clear waters. Beautiful. A tranquil stretch of the Big Santa Anita Creek in the Fern Lodge area of the canyon. This spot is near the little cabin village where the Upper Falls and Gabrielino trails depart the canyon bottom. This gopher snake is doing her part in keeping down the rodents. This photo was taken recently in the Fern Lodge area of Big Santa Anita Canyon. Snakes of all kinds abound, mostly non-venemous. All snakes are by nature, secretive, preferring to not be seen. Unfortunately, gopher snakes are occasionally mistaken for rattlesnakes. However, this snake, like most, is harmless to people. Gopher snakes seek out mice, rats, frogs and occasionally ground squirrels. This snake is also a mortal enemy to rattlesnakes. Gopher Snake in rock wall. Big Santa Anita Canyon, Fern Lodge area. Like king snakes, gopher snakes take their prey through constriction, swallowing their catch whole. This is done by the snake purposely dislocating its’ jaws, allowing larger prey to pass on through to the esophagus and stomach. Gopher snakes can grown upwards of 4′ in length, climbing through rocks and even occasionally up a tree! My wife and I once watched a 3 footer climb up the side of a mature canyon live oak at the trail junction of the Upper Falls and Gabrielino trails. It was amazing to watch it slowly and carefully work it’s way up the steeply sloping trunk. These are patient creatures to say the least! If you are lucky enough to spot one, give him or her a little space. Last weekend’s double storm system brought much needed moisture to the Big Santa Anita Canyon. The San Gabriel mountains, along with most of Southern California, received a brief reprieve from the lengthy drought. Multitudes of canyons received enough rain (little snow) to thoroughly scour out the stream beds. The black organic mat which had affixed itself to all the rocky and sandy bottoms of streams and pools the last couple of years was washed away in just a few days. White and tan sands have once again come into view. Pools that had decreased in depth have deepened. This is good news, not only from the standpoint of esthetics, but for wildlife. Fish and other creatures will benefit from this natural cleansing. Spawning will now become possible. Water temperatures will decrease and available oxygen will increase. This change is good for everyone. Our rain gauge near Fern Lodge Junction, not far from Chantry Flats, received over 7.36″ of combined rain from the two storms. 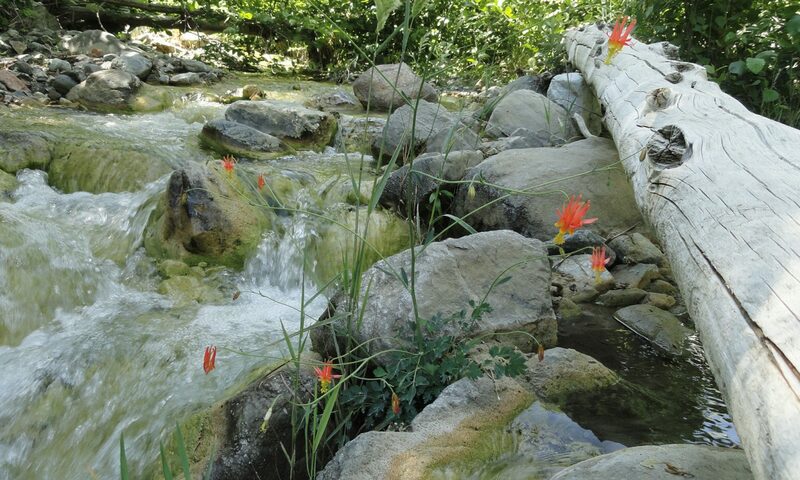 The sounds of a tumbling mountain stream have returned and the myriad of organic scents are throughout the Big Santa Anita and Winter Creeks. Especially noticeable is the staccato call of the Canyon Wren, with the descending notes reminiscent of laughter followed by a quick little question…. The dust is gone for now and everything gleams clean and green. The attached photo was taken last Sunday just above Sturtevant Falls on the Upper Falls Trail. Notice that the water has been colored by the tannins of fallen leaves and abundant organics from the mountain soils. A hopeful big leaf canyon maple puts out her fresh leaves and catkins. This juvenile rattlesnake has just settled into digesting her meal. Notice how the camouflage blends with the fallen oak leaves. A young gopher snake exploring on freshly raked sand at cabin #63, Fern Lodge in Big Santa Anita Canyon. All of the front country of the San Gabriels are warming up, especially here along the Chantry Flats Trails. Days are lengthening, grasses are drying out, stream flows are lessening and the lizards and snakes are on the rise! There’s so much to see. And to smell…. The fragrance of last year’s decaying leaves in the loamy stream bed’s sands is at times pungent or mildly in the back ground of your senses. This “signature” scent is throughout all the deep, steep canyons of our range. Anywhere you’re in the Angeles National Forest, perhaps on a waterfall hike, organic reminders of our earthy platform that all life springs from. White alders are fully leafed out, their canopies swaying lazily back and forth in the breezes of warmer days. Bright greens of leaves and blue sky mingle together above us as the old earth tips more and more northward with the promise of longer days. At our feet, creatures are wide awake and stirring about. The lack of winter rains has in some way been a catalyst for our Spring season changing to Summer in a few short weeks. Take time to look down at this miracle all around our feet. Snakes and lizards make good use of camouflage to blend in with their native surroundings, so take your time and be still. The top image of the rattlesnake was taken after I almost stepped right on it by accident while alongside a cabin just below Sturtevant Falls. You can see how well it blends in with the fallen oak leaves. The lizard image was taken on the side of a cabin wall near the East Fork of Big Santa Anita Canyon. These insect eaters are agile climbers on the textured rock surfaces. The bottom image is of a mature gopher snake that has just recently shed its’ skin. These non-venemous snakes are often incorrectly identified as rattlesnakes. Gopher snakes constrict their prey, which consists primarily of mice and other small rodents. While out hiking, stop once in awhile to look and listen to all the small miracles happening all around you. You’ll be glad you did. Two Southern Pacific diamondback rattlesnakes await relocation in a Rubbermaid 20 gal. size barrel, just for this purpose. Always use care when relocating rattlesnakes in Big Santa Anita Canyon. Everything’s blooming right now in the front country of the Angeles National Forest. Hikers make their way up the Gabrielino Trail to the cool, moist beauty of Sturtevant Falls. Colors are vibrant, sweet floral scents waft in the canyon breezes and the streams are as full as they’ll be until next winter’s rains. This last weekend my wife and I were at our little cabin in the Big Santa Anita with all the windows open and the sound of bird song carrying throughout. While raking, Joanie noticed the tail of a mature rattlesnake sliding underneath the low shutter of an enclosure attached to our toolshed. I grabbed my snake stick (garden hoe minus the blade) and relocation barrel (20 gal. Rubbermaid trash can) for the task at hand. Very carefully, I lifted the shutter to find a very healthy and cautious rattler looking back at me from the shadows. Its’ neck and head were lifted in the manner of a cobra. While prodding the snake with the stick, I mentioned to Joanie the possibility of two being present. Up at Sturtevant Camp, we had once caught two snakes within a short distance of one another on a warm summer day. One large female was in my wife’s flower garden and the other near the Ranger Cabin. Sure enough, there was another snake! This rattler was more slender and challenging to capture. The larger one was easy to catch. You just have to get her to drape across the metal hook at the end of the wooden handle. Once that’s accomplished, just lift the serpent up and over the wall of the barrel, making sure to gently set down. Next, we added the smaller partner. The two immediately began to snap at one another! Very unlike the behavior of the earlier Sturtevant pairing. The larger, darker and stouter partner would occasionally utter a low and irritated “hiss……” at the other. Suddenly their bodies would slap up hard against each other. Certainly, it was time to release them to the unconfined wilds of the Big Santa Anita Canyon’s East Fork, away from all human habitat. The snakes continued to rattle inside the barrel which was held snugly up to my back as we hiked up the quiet side canyon. The rattling sounds a bit like a snare drum that never stops. When we reached the spot of disembarking, it was just a matter of carefully removing the lid and turning the barrel on its’ side as sliding snakes made their way down the wall to the earth. Both snakes were worn out and just lay side by side very peacefully. We watched down as warm spring light spilled down on both these fascinating and terribly misunderstood creatures. The larger snake had a crimson dot, perhaps from a nip, on her snout. So, keep your eyes and ears open for rattlesnakes, especially as the temps rise and the days lengthen. Rattlesnakes, like all snakes, are solitary and reclusive creatures. If you should happen upon one while out on a hike, just give it distance and a way out. Let it live in peaceful solitude. They belong, too, in this vast and varied universe of life. A dark-eyed junco gathering nesting materials. Fern Lodge, Big Santa Anita Canyon. I took this picture of a Dark-eyed Junco a few days ago in the Fern Lodge area. Just a half mile downstream from Sturtevant Falls, this little female was collecting dried grasses for her nest. The Big Santa Anita and Winter Creek canyons are filled with bird song from many species of birds. The habitat where this picture was taken is riparian/woodland, a land of rushing streams, boulders and trees. Perfect for supporting lots of life! This is a short story about hiking the abandoned Burma Road of Chantry Flats. You can see the route of this old road on the Chantry Flat – Mt. Wilson Trails Map, available on this website, or at the Adams Pack Station General Store next to the Chantry Picnic Area. This old road was once the carved out thoroughfare of cement mixers, bulldozers, skip loaders, cranes and more during the construction era of the check dams upstream from Sturtevant Falls. Today it rests quietly , slowly being reclaimed by the mountains. It was warm and mild out on the front porch of the cabin. A gentle breeze woke up the chimes hanging from the eve. The ringing was calm and faint. I set down my book, relaxed and yawning in the bright February sunshine. What to do? Maybe take a nap if I didn’t start moving or perhaps, hike up to the prominent switchback of the long-abandoned Burma Road. Only a mile and a half in from Chantry Flats, one can suddenly transport one’s self into a chaparral-clad wilderness of upward climbing. So, I’m doing this crawl up a gully between two of our neighbors’ cabins. At first, like everything we don’t know the whole story of, it’s really easy. Lush, green grasses blow lazily about my boots as I plod upward. Shaded by blossoming bay trees, the air is sweetened by thousands of the tiny yellow flowers. Large and stately canyon live oaks begin to make their presence as I climb further and further from the Big Santa Anita Creek. The slope’s steepness increases and I’m constantly stopping and kicking into the moist, sandy slope. The one thing that I packed, the one thing that I’d really need for this trip was a pair of smallish pruners, or loppers, for cutting through brush. These became indispensable as my route began to be impinged upon by dense, dry tangles of brush. Several times, even the little folding pack saw came out for branches that were over a couple of inches in diameter. So, my pattern was often moving up the mountain gully a few paces, clipping and sawing, then pushing through the tiny opening to step up a few more paces…… I was soon high enough to see Mt. Harvard out across the Winter Creek Canyon. Chamise and buckbrush began to make their presence. This was the really hard going. Soon I was wading hip deep in black sage, which left its’ signature scent in all my clothing. Clutching at little twiggy limbs, I pulled myself up the final pitch to the old Burma Road and a fragrant, blossoming patch of rosemary. This same spot was visited by Richard Loe and I last spring. However, we had walked and climbed up the decaying switchbacks of the old road near Sturtevant Falls. That day we ran into three stout, black rattlesnakes gliding through piles of white rocks – all within a couple of minutes! This time, I was a good month earlier in the season, so rattlesnakes were the last thing on my mind. From the end of this switchback, I could make out the Pacific Ocean, while Catalina Island appeared to float on the hazy scene. After drinking a little water and shaking the chaparral fragments out of my clothes, the thought of how to return slowly made its’ way in. It was a sparkling, dazzling clear day. All courtesy of the mild Santa Ana winds. The startling clarity of vistas and the mild temps make Southern California’s mountains a paradise. I just wanted to stay out in it and make the day last. One thing for sure, the route back down the gully was doable, yet not what I really wanted to do. I looked across and down to Sturtevant Falls emerging out a gash in the white cliffs from my unique vantage point. It was decided, continue up the abandoned Burma to the where it enters the North Fork and then back down to the Upper Falls Trail. This would be a great way to make a loop out of my trip. There’s brush all over the Burma Road. In case you’re wondering what this road was all about, you can read a blog I wrote earlier on about the building of the check dams. Entitled, “How Did All These Dams Get Here?” The abandoned Burma Road shows up on the Big Santa Anita Canyon Trails Map. On I hiked, weaving through sumac, sage, yuccas, non-native pines and eucalyptus (planted by the Forest Service), manzanita and more. At one point I got mixed up and wandered off on some kind of spur road that must have dead ended. However, before that was figured out, the sumac was chest high and the beating through the brush had become relentless. There was a beautiful scene that just had to be photographed. It was a hoary leaf ceanothus (Ceanothus crassifolius) also more commonly referred to as buckbrush or wild lilac. One of the great things about the hoary leaf variety is that there are no thorns to be reckoned with! This shrub blooms usually from January through April and emits a sweet, sugary fragrance from its’ myriad tiny flowers along the branchlets. Right now, you can see lots of this beautiful plant blossoming on the slopes across the canyon from Chantry Flats. Not long after this, I was once, again, wading through the brush when I heard a dull, flat hiss coming from the ground near my left boot. It couldn’t be…. I looked down and saw an irregular opening in a boulder lodged in the ground. Perhaps a brother or sister of the Crotalus genus had been startled by my careless wandering… Time to back straight out and look for where the road really ran. It had been since 1977 or 78 when Howard Casebolt and I followed this same section of the road, so now it all seemed so new and fresh! Fortunately, I found where the road made a sharp hairpin and was soon on the right track. There were road cuts that were so deep (25-30 feet high) and narrow that the road was cool and damp. Gooseberry bushes even liked these spots. Dark green, plump grasses lay down in these dark, secret places. Eventually, I walked and scrambled along the road’s remains in the area I call the “Great White Scar,” visible not only from Chantry Flats, but much of the San Gabriel Valley below when you look up the mouth of the Big Santa Anita. Although the sun was nearly over the ridge by now, heat radiated out from the plane surfaces of jagged, white rocks. Thoughts of large, anxiety-ridden serpents occasionally filled my mind as I continued to hop from rock to rock and beating back more brush. Eventually I made my way to the large pine flat just above the North Fork confluence near cabin #94. Whew! The one thing I didn’t bring and began to wish I had, was a flashlight. Soon I was scrambling down the side canyon to the Upper Falls Trail in the gray and failing light in the canyon bottom. Arriving at the cabin, I chuckled to myself just how pivotal one’s decision to take a nap or go for a “little” hike can be. As you wander along the banks of the Big Santa Anita or perhaps its’ tributary canyon the Winter Creek, watch for the water-loving dippers. Known as American Dippers or Water Ouzels (Cinclus mexicanus), these small birds hop from rock to rock and true to their name, dip their heads and bodies down into the rushing stream in search of food. The Dipper does this squatting dance, bobbing its’ body up and down, up and down, before flying off low over the water. If you’re lucky enough to watch one swim, you’ll notice how similar these enchanting creatures are to ducks. Sometimes they’ll thrust their head down into the current, other times they’ll dive down completely vanishing into pools and small rapids. Dippers have an extra eyelid to help with seeing underwater, much like having built-in goggles! Their food, at least in the Big Santa Anita creek, consists of dragonfly nymphs and caddisfly larvae. To help stay warm, these birds secrete oil, helping to keep their feathers and skin glossy and water repellant.Listen for their song as you hike along. It sounds like a high pitched whistling or trill, repeated over and over. Photos and drawn diagram courtesy of Bing Images.